where \(\sigma\) is a stress tensor, \(f\) represents body forces, \(D\) electric displacement, and \(\rho\) distributed charges. where \(C\) is an array of constitutive relations and material parameters. This leads to a system of three equations for the unknown displacements \(u\) and \(v\), and the potential \(V\). 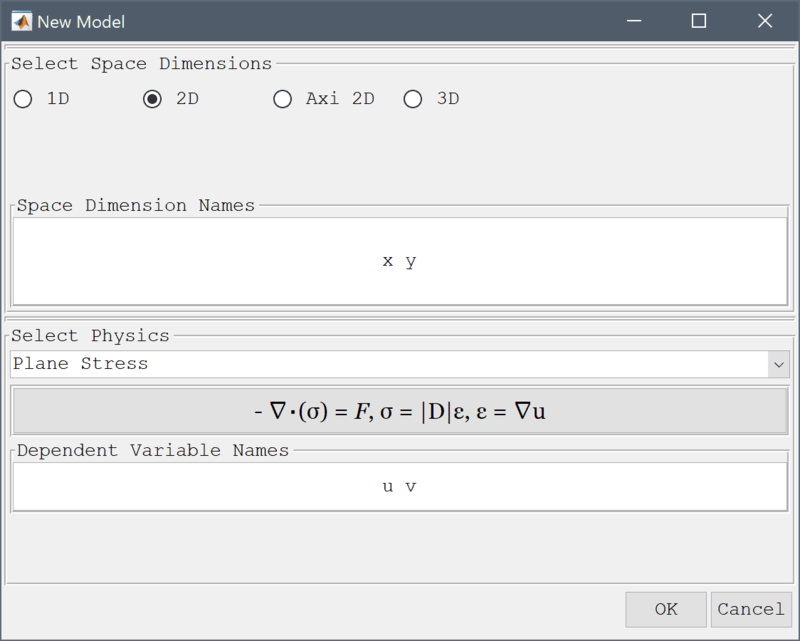 This model is available as an automated tutorial by selecting Model Examples and Tutorials... > Multiphysics > Piezo Electric Bending of a Beam from the File menu. Or alternatively, follow the step-by-step instructions below. 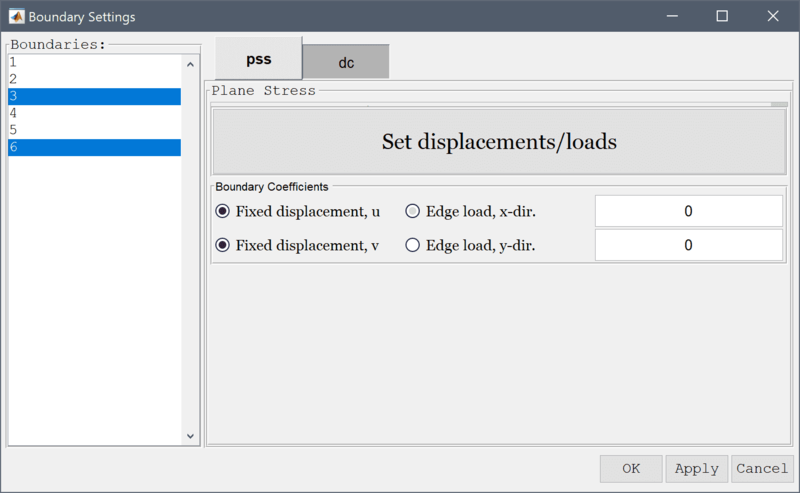 Select the Plane Stress physics mode from the Select Physics drop-down menu. The beam consists of two 120 x 1 mm rectangular subdomains. First create the upper half and then copy it with a -1 mm offset. Enter 0.12 into the xmax edit field. Enter 0.001 into the ymax edit field. 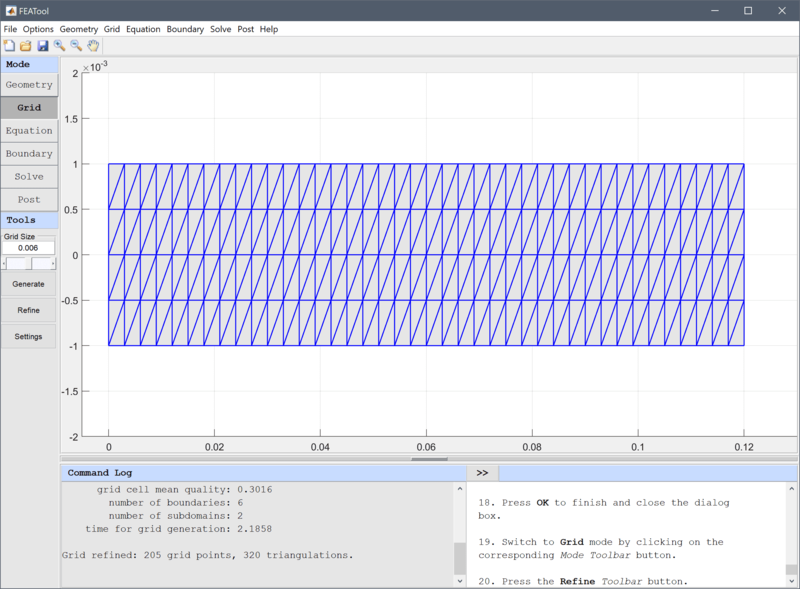 Enter 0 -0.001 into the Space separated string of displacement lengths edit field. As the beam is very thin, manually change the axis ranges to see it better. Enter -0.005 0.13 -0.002 0.002 into the Axis limits edit field. Enter nu into the Poisson's ratio edit field. Enter E into the Modulus of elasticity edit field. Second order accurate finite element shape functions are used for the displacement which are more accurate and allows for a coarser grid. 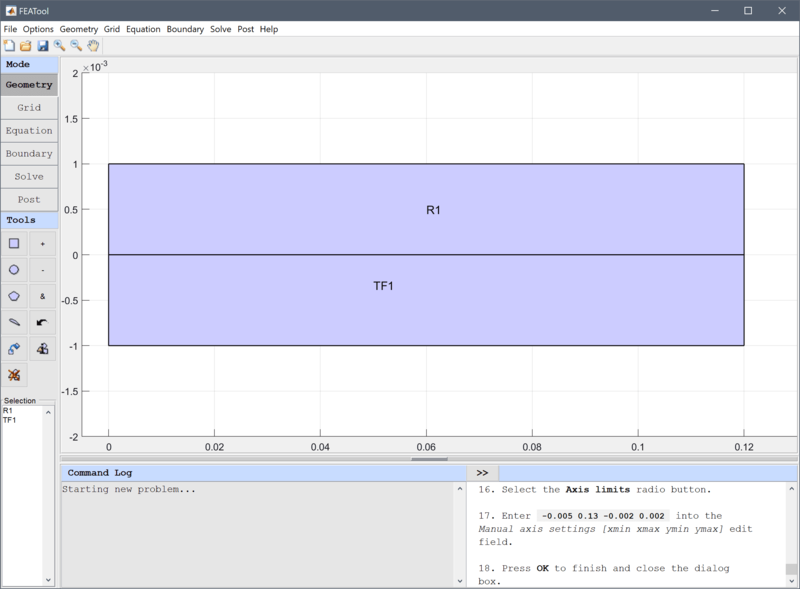 Select (P2/Q2) second order conforming from the FEM Discretization drop-down menu. 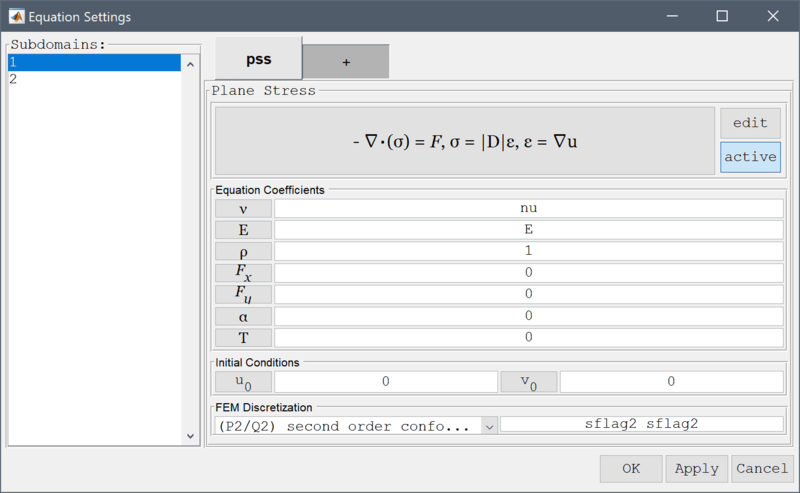 Open the edit equations dialog box and modify the plane-stress equations to include the coupling terms for the piezo-electric stress contributions, that is e31*Vyx and e31*Vyx. Enter -E/(1-nu^2)*( (ux + nu*vy)_x + ((1-nu)/2*(uy+vx))_y ) - e_31*Vy_x = 0 into the Equation for u edit field. 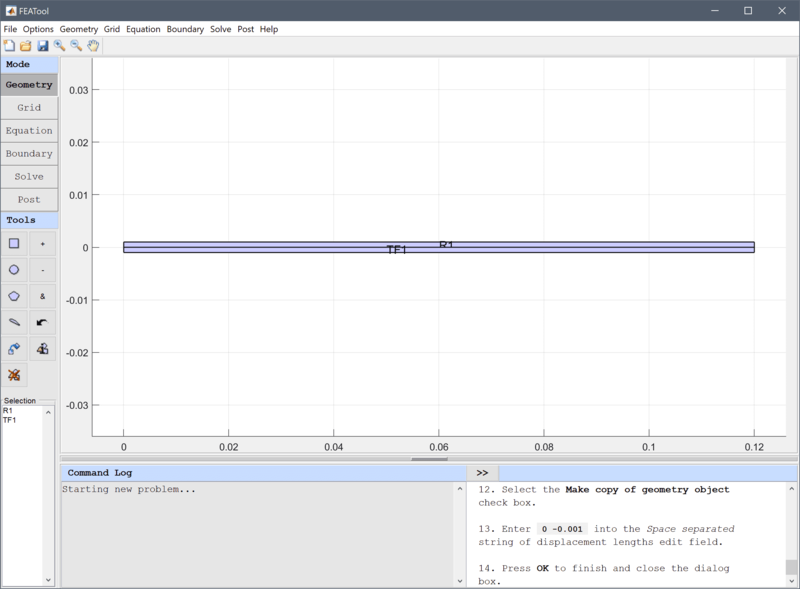 Enter -E/(1-nu^2)*( (nu*ux + vy)_y + ((1-nu)/2*(uy+vx))_x ) - e_33*Vy_y = 0 into the Equation for v edit field. 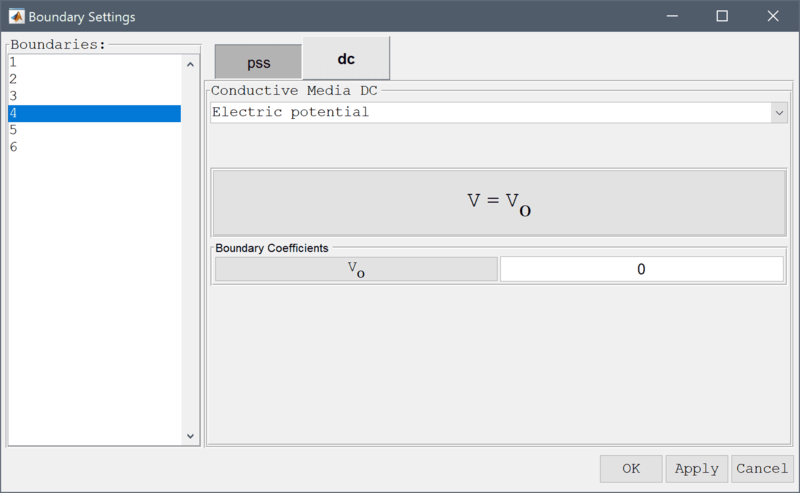 Add the Conductive Media DC physics mode to account for the electrostatics effects. Again, change and modify the electrostatics equation to account for the piezo-electric effects. Enter -(e0er*Vx_x + (e0er+c_33)*Vy_y + e_31*ux_y + e_33*vy_y) = 0 into the Equation for V edit field. Press OK to finish equation editing and close the subdomain settings dialog box. 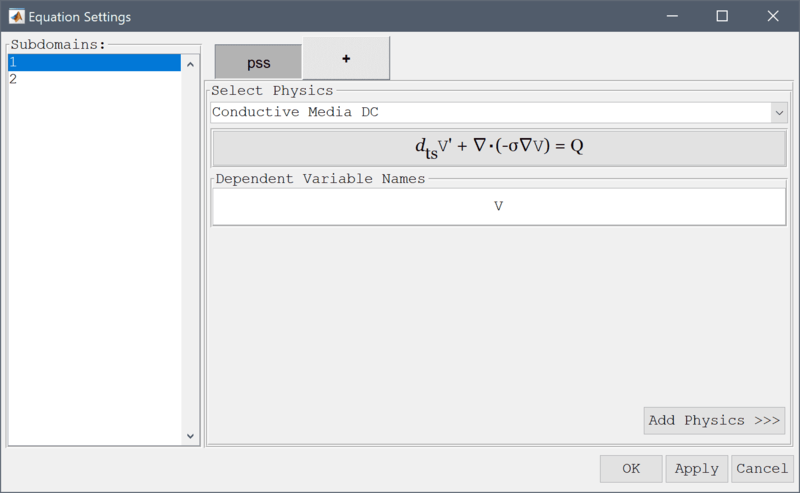 In order to define the piezo-electric modeling constants and expressions, press the Constants Toolbar button, or select the corresponding entry from the Equation menu, and enter the following variables in the Model Constants and Expressions dialog box. Note how the scaling factor s =-1 1 is used to invert the coefficients between the upper and lower halves. See the reference for more details. The beam is considered fixed at the left end, which means constrained displacements in all directions. 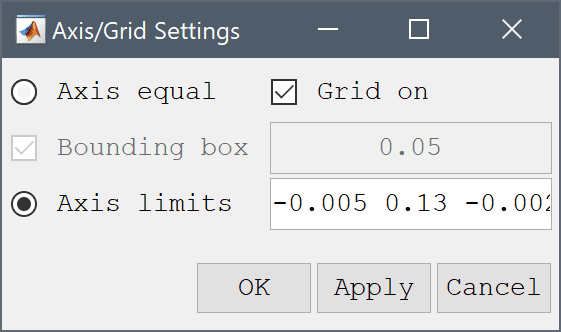 Select 3 and 6 in the Boundaries list box. Switch to the dc tab. A voltage difference of 250 V is applied between the top and bottom boundaries. 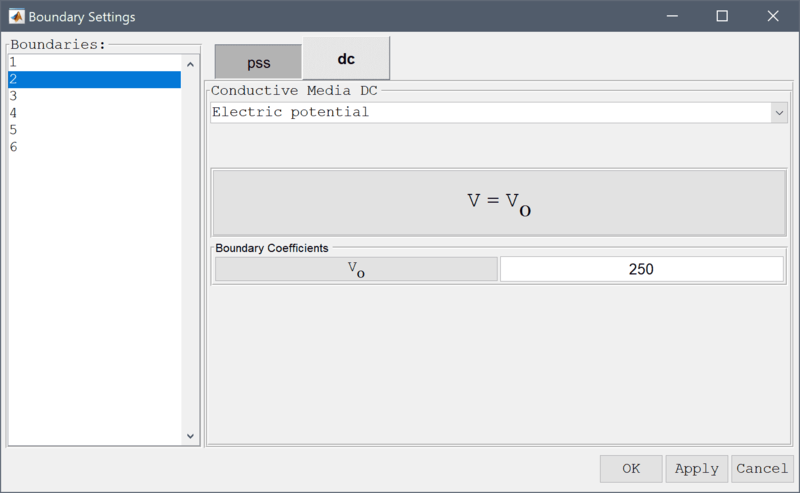 Enter 250 into the Electric potential edit field. Plot and visualize the displacement in the y-direction. The maximum displacement it around 29.6 µm which agrees well with the theoretically expected solution. 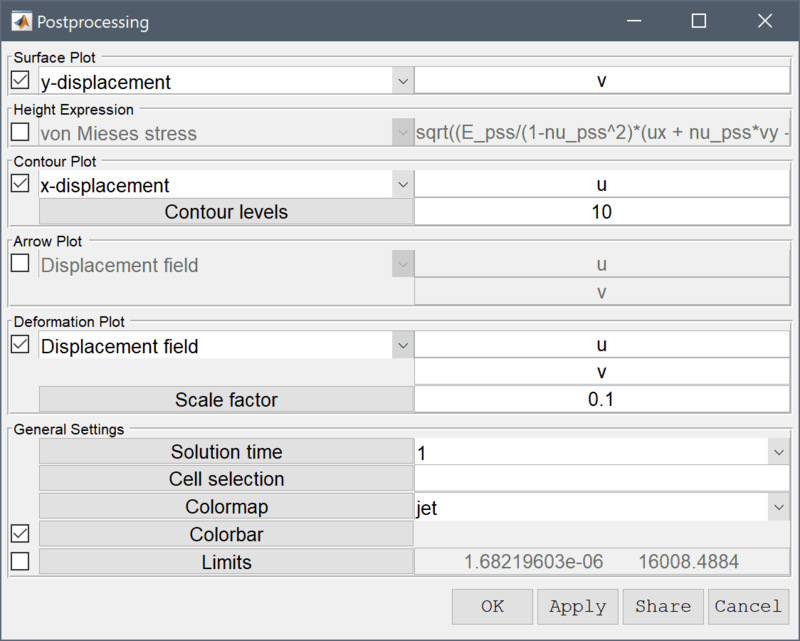 Select y-displacement from the Predefined surface plot expressions drop-down menu. 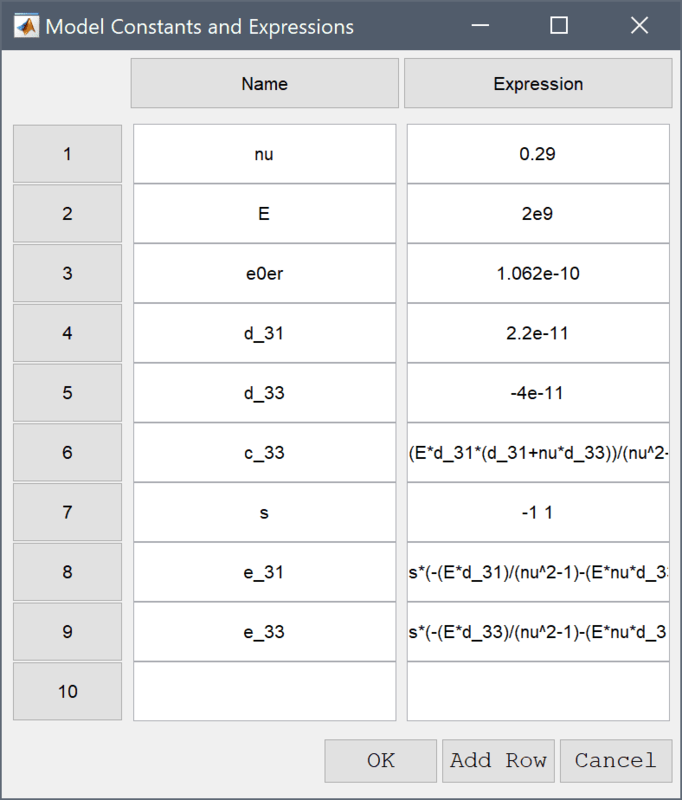 Select x-displacement from the Predefined contour plot expressions drop-down menu. 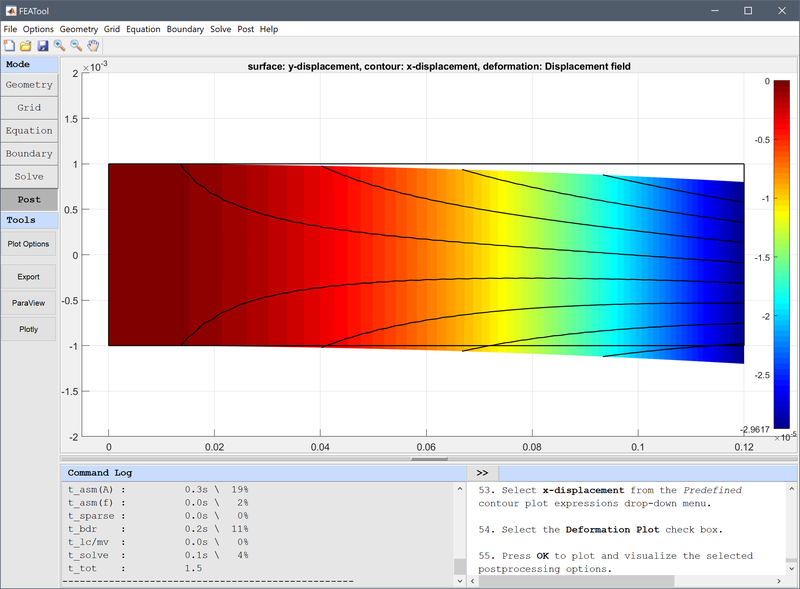 The piezo electric bending of a beam multiphysics model has now been completed and can be saved as a binary (.fea) model file, or exported as a programmable MATLAB m-script text file, or GUI script (.fes) file. In this section the model is defined and solved as a MATLAB m-script file. Here we will be looking at composition of two 1.2 cm long and 2 mm thick beams with opposite polarization. Next is to define the equation coefficients and constitutive relations. See the attached file for their definitions, one thing to note that to define the polarization the coefficient is multiplied with a switch expression 2*(y<0)-1 which evaluates to 1 in the top half and -1 in the bottom (here we have also used the name y for the space coordinate in the 2nd direction as we defined earlier). % due to fem partial integration). where each bilinear form has four terms, the top line in the definition defines the finite element shape for the dependent variable, and second line for the test function space (a 2 indicates x-derivative, and 3 y-derivative). An example m-script file for this model can be found in the ex_piezoelectric1 m-script file. Tseng CI. Electromechanical Dynamics of a Coupled Piezo-electric/Mechanical System Applied to Vibration Control and Distributed Sensing. Univ. of Kentucky, Lexington, 1989. Pierfort V. Finite Element Modeling of Piezoelectric Active Structures. ULB, Faculty of Applied Sciences, 2000. Hwang WS, Park HC. Finite Element Modeling of Piezoelectric Sensors and Actuators. AIAA Journal, Vol. 31, No. 5, 1993.